Chancellor Tom George has been the public face of the University of Missouri–St. Louis, serving as its top administrator and ambassador, since 2003. But he remains a scientist at heart. 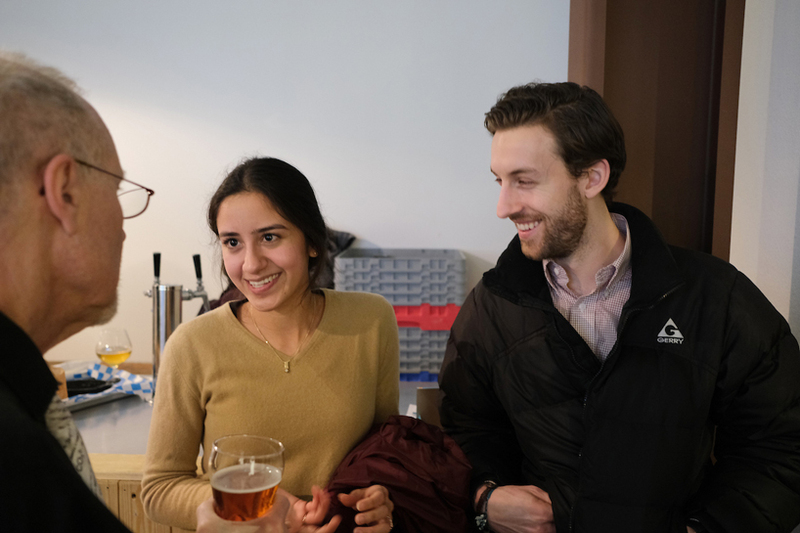 George’s research specializes in chemistry, nanophysics and nanomedicine, and he had the opportunity to share some of his expertise – and a beer – March 11 during the Astronomy on Tap event at Urban Chestnut Brewing Company’s Grove Brewery and Bierhall. 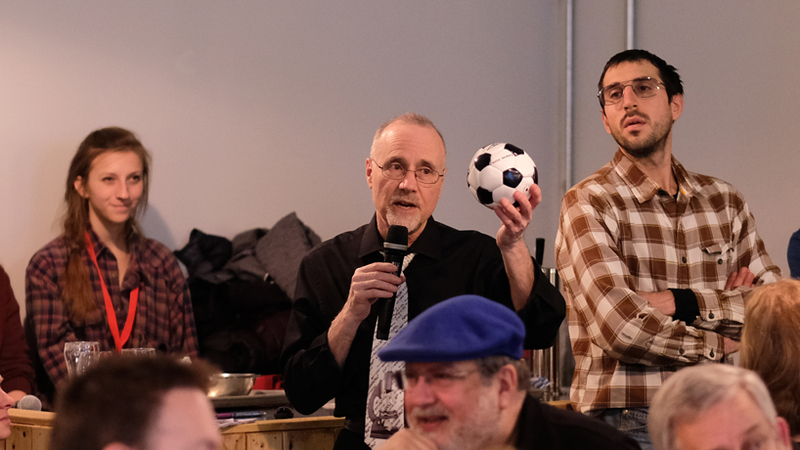 He gave a presentation on “Soccer Balls from Outer Space” to an overflow crowd in the brewery’s event space. The “soccer balls” he spoke of were, in fact, buckminsterfullerene or “buckyballs,” molecules first discovered by British scientist Harold Kroto and American collaborators Richard Smalley and Robert Curl Jr. in 1985. 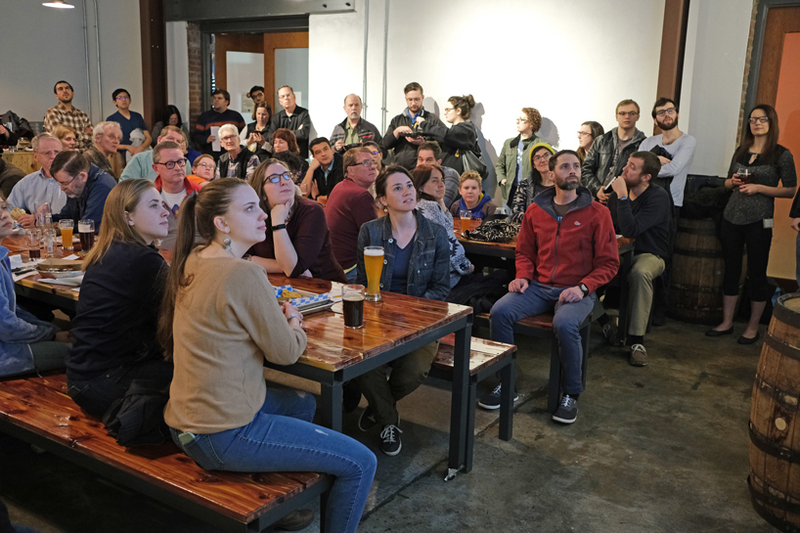 An overflow crowd listens intently as Chancellor Tom George provides a lesson on buckminsterfullerene or “buckyballs” at Urban Chestnut Brewing Company. “Harry Kroto had postulated that up in intergalactic space there were all sorts of carbon chains, and it’d be interesting to see if people could reproduce these carbon chains in a laboratory,” George told the audience at Urban Chestnut. “At that point, he did not know about buckyballs or buckminsterfullerene, but he knew that there was something interesting in intergalactic space, and he paired up with Rick Smalley, who had a great laboratory at Rice University. That particle in question was a highly stable cage-like molecule made up of 60 carbon atoms, joined together by single and double bonds in the shape of a hollow sphere with 12 pentagonal and 20 hexagonal faces, similar to a soccer ball. They named the molecule after American architect Buckminster Fuller, who designed the similarly formed geodesic dome. They won the Nobel Prize for their pioneering work in 1996. George said the molecules haven’t just been discovered in outer space but that geologists have also uncovered it in Precambrian rocks on Earth. Chancellor Tom George (at left) speaks to 2017 UMSL biochemistry and biotechnology graduates Sara Ricárdez and Evan Garrad after his Astronomy on Tap presentation on March 11. Ricárdez works as a research technician at Washington University in St. Louis, and Garrad is a medical student at the University of Missouri–Columbia. He described some potential applications of the molecules and noted that they’re being explored now for medical therapeutics as a way of delivering drugs into the system, though there’s still debate on their potential toxicity in the human body. George then fielded questions about the molecules. The March 11 Astronomy on Tap event also featured a presentation from Ryan Clegg Watkins of the Planetary Science Institute on “New Views of the Moon: 50 Years Since Apollo.” She talked about renewed interest in lunar exploration. The Astronomy on Tap event was presented in partnership with the Academy of Science of St. Louis and as part of the NASA Jet Propulsion Laboratory’s Solar System Ambassadors Program with ambassador Andres Plazas Malagon serving as the host. UMSL graduate students Emma Young and Eva Colberg also helped organize the March 11 activities.